Over the past two weeks, we’ve watched our young tennis stars take on the world in the Australian Open. It’s an exciting time for them, and we all hope they go on to the great success they deserve. This week we’ve watched our young tennis stars take on the world in the Australian Open. It’s an exciting time for them, and we all hope they go on to the great success they deserve. I remember when I was starting out as a young tennis player, I watched all the sport I could, getting inspired by the skills and performances of the players who played on those very courts decades ago. With any luck, thousands of children are getting inspired by our promising young guns today. We want children to be inspired to play sport. Staying active in youth is the easiest way to stay healthy as an adult. We need to champion sport and make it accessible and safe for all children. But sadly, our high-profile codes are addicted to the ‘pot of gold’ sponsorship dollars of alcohol companies and other addictive industries. OK, so what, when we live in a thriving market economy where sport is central to our lifestyle? What immediately fouls this scenario of happy first-world living is the ‘exemption’ that crept into Australian advertising codes in the 70s which negates the protections around marketing harmful products to kids during children’s viewing hours. As a former professional tennis player, commentator and now a politician serving my community, I am exasperated by the sports exemption and the gradual weakening of controls that were introduced half a century ago, quite rightly, to protect minors from addictive and harmful products. During my tennis career, alcohol definitely played a part in the networking and socialising aspects of the game and the industry, as well as game tactics. But in today’s world sport is a serious, high market-value business and expectations have changed. In elite sport today, and especially in the case of our top tennis players, many don’t drink alcohol at all, and most only drink in their off season. It’s near impossible to successfully perform competitively at the highest levels of sport while indulging in unhealthy habits. While there’s been a general shift away from alcohol harm by the majority of athletes, it hasn’t yet translated to the sporting codes due to their strong reliance on the revenue from alcohol sponsorship. 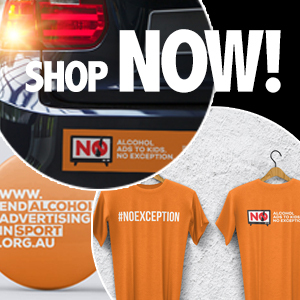 Therefore the advertising exemption is adored and abused by alcohol marketers in equal measure, with half of all alcohol advertising being shown during the broadcast of live sporting events. It’s a loophole that allows the alcohol industry to bypass all protections and funnel alcohol ads straight to kids during TV sports coverage in children’s viewing hours. Last October, when launching the End Alcohol Advertising in Sport campaign, the Foundation for Alcohol Research and Education (FARE) released a report on the prevalence of alcohol ads during the football grand finals. It found advertisements appeared at the rate of just under one per minute for the AFL and more than three per minute for the NRL. These games were mostly played during children’s viewing times. Meanwhile, all Test cricket is played during children’s viewing times. The alcohol industry claims that their advertising is intended to encourage existing drinkers of legal drinking age to switch products, rather than encourage excessive drinking or non-drinkers to drink. Yet industry documents reveal a different story where brands have used market research data on 15 and 16 year olds to guide campaign development, target their products and advertising to attract new drinkers, and encourage people to drink early and drink often. This is not fair. We need to stop perpetuating a positive association between alcohol and sporting heroes. A longitudinal research study released this week by Cancer Council Victoria and VicHealth, shows that risky drinking can be reduced by reducing alcohol advertising on TV. I am an Ambassador for the national End Alcohol Advertising in Sport campaign and I give my wholehearted support to ending this exemption. It is an achievable policy correction that can quickly reduce the risk of harm to young Australians.